5 Years of experience in Business Development. Before stepping into the professional pitch, the management graduate, Ms. Priya Yadav, had completed her post-graduation in Finance & Human Resource. Her professional journey has completed a span of 5 years. 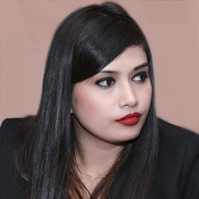 Apart from managing the Business Development she is playing a crucial role in HR also. She worked with top companies like HT Media and Uninav Developers in the past.